I’ve always thought it would be fun to eat at different restaurants and do reviews on the food and service. While the experiences of trying new foods and new eating establishments would be wonderful, I don’t think I am objective enough to be critical. I look for what’s good, what’s unique, what works in each restaurant, rather than any negatives. Yesterday, I got to try an established restaurant in Arkansas that was new to me. Today, thanks to a spontaneous lunch invite from my friend, Garen, I had the opportunity to try a restaurant that is new to Joplin and unfamiliar to me. 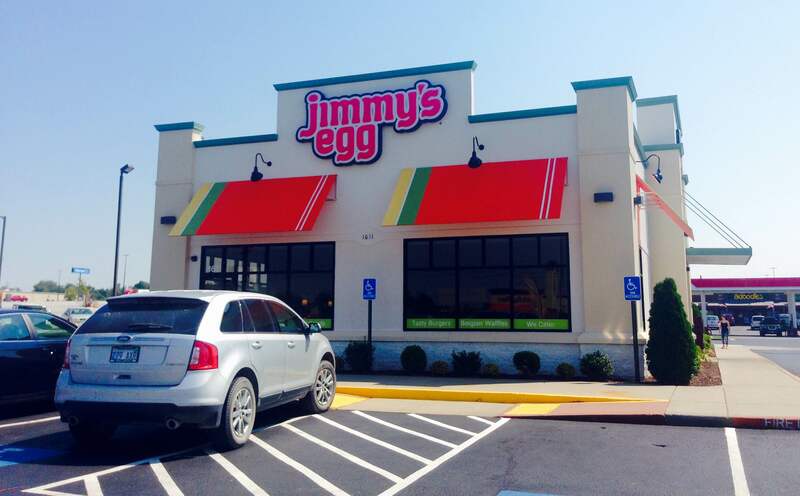 Jimmy’s Egg, located at 1611 S Range Line in Joplin, recently opened. What a fun name! I figured out the chain restaurant offers an assortment of egg dishes, for breakfast and lunch. I knew nothing else about the franchise. 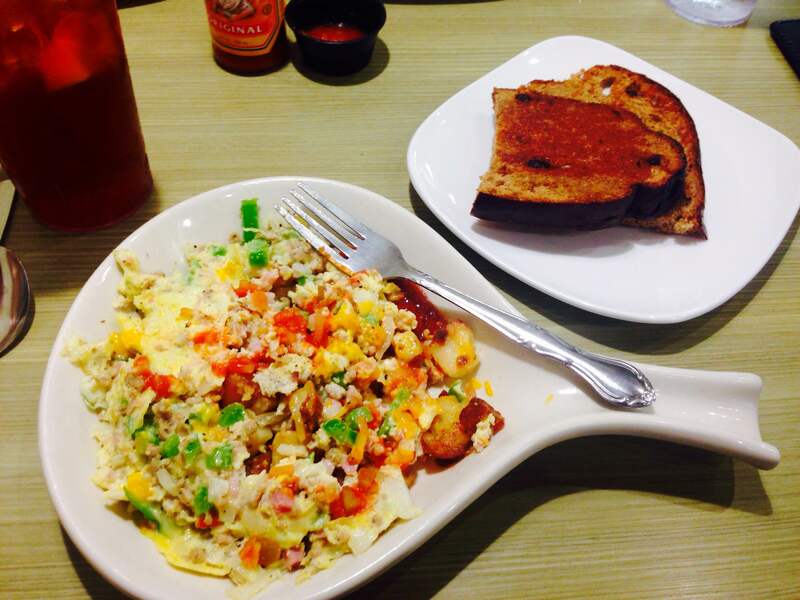 Launched from Oklahoma City, OK, in 1980, Jimmy’s Egg, named after the original founder Jim Newman, specializes in cracked-to-order three egg omelets and scrambled skillets, cups of coffee and freshly baked breads and biscuits. Also on the menu are pancakes, French Toast and Belgian waffles. And for lunches, freshly made salads, hamburgers and sandwiches. The restaurant is open daily from 6:00 am to 2:00 pm. Loc Le, who was a Vietnamese refugee seeking asylum in the US, purchased the single restaurant from Jim. Loc and his wife grew the business to 14 restaurants in the Oklahoma City metro area. In 2008, Loc joined with Garfield’s owner Jim Burke, launching the franchise, which now has 23 locations in Oklahoma, Missouri, Texas, Nebraska and Kansas. I was expecting more of a fast food type establishment, but Jimmy’s Egg is a sit down restaurant, with friendly staff and a great menu. Garen and I both elected to have breakfast for lunch. I zeroed in on the Farmers Scrambled Skillet, a delicious combination of scrambled eggs, ham, bacon, onions, peppers, cheese and homestyle potatoes, and a side of homemade cinnamon raisin bread. Garen opted for a Mexican omelet. with sides of the cinnamon raisin bread and biscuits and gravy. I might add, that neither of us had eaten anything yet when we had lunch! It was a great meal, with a very cheerful, attentive server who kept our water and tea glasses filled. We had an assortment of salsas and sauces to try with our eggs. The restaurant was clean, with that still-new look, and busy, with plenty of booths and tables for seating. I appreciated Garen’s invitation. And as always, I appreciated Garen! We chatted and caught up with each other’s journeys, which is valuable enough. However, Garen offers insights, suggestions and stories out of his heart and his experiences, which I find priceless. He is an amazing companion to journey through life with. And adventurous to look for new restaurants to try, new foods to savor. Great qualities in a fellow traveler, and great choice in a restaurant today!